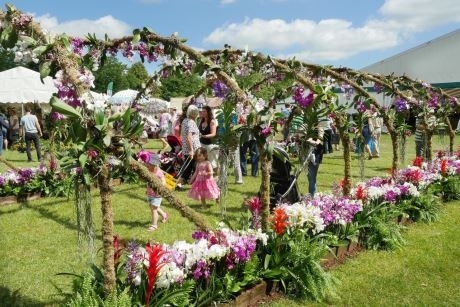 It has been revealed that the annual Blenheim Palace Flower Show will return to the Oxfordshire World Heritage Site from 21st-23rd June, 2019. Now in its seventh year, the three day show celebrates the best of gardening, home and lifestyle. The centrepiece of the show will be the 20,000 square foot Grand Floral Pavilion, featuring more than 30 floral displays and a large selection of flowers and plants from some of the finest UK plantsmen. Visitors to the event can also expect garden talks with experts and enthusiasts, food and drink, an outdoor plant village and live entertainment throughout the weekend. The horticultural show will house over 300 exhibitors on the South Lawn of the Palace grounds. The shopping village will feature a variety of trade stands, selling everything from garden gazebos to greenhouses, gardening sundries, and more. The Home and Country Living Pavilion will contain original handmade giftware, jewellery and luxury goods. Matthew Upson, show director and managing director of Aztec Events, said: “Blenheim Palace Flower Show has really established itself as one of the great summer occasions and there couldn’t be a finer setting for a flower show than the beautiful landscape of Blenheim Palace. Blenheim Palace is the home of the 12th Duke and Duchess of Marlborough, as well as the birthplace of Sir Winston Churchill. The palace hosts a wealth of events, themed tours and exhibitions throughout the year. Admission to the Flower Show includes entry to the park and gardens, so visitors can combine a visit to the event with a day of exploring Blenheim Palace’s formal gardens and 2,000 acres of ‘capability’ brown parkland. Groups visiting Blenheim Palace can also benefit from group talks and tours (when booked in advance) and discounted rates on audio guided tours. For more information visit, www.blenheimflowershow.co.uk.